Let’s see how the gamut masking (or "mapping") method actually works, using the example of that bright colored Las Vegas scene. This video walks you through it, step by step. (Video Link) By comparing the three paintings below, you can see how the two smaller paintings were shifted to the warm and cool. Note that underneath each of the two shifted paintings is a set of nine swatches. Those are the subjective primaries carried through three values each. Each of the paintings was done with those carefully limited subjective primaries, leaving aside the tube colors. Note also that two of those primaries are the same: the green-cyan, and the red-magenta. The wild card is the yellow in the top one and the blue in the bottom one. Now look at those three swatches connected by arrows. 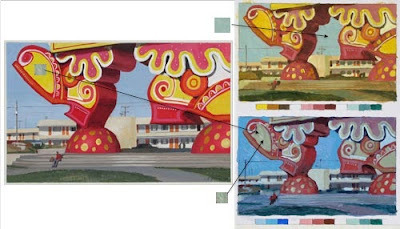 The color note that appears as the blue sky in the warm scene is almost exactly the same color as the color that appears yellow in the cool painting. Both are basically a neutral gray. It’s a subjective secondary belonging to each of the two gamuts. I’ve out lifted those swatches out of the smaller paintings so that you can see how they look out of context. I’ve also lifted a swatch of the “yellow” from the cool painting and put it over the yellow shoe in the original painting. It’s hard to believe that a neutral gray could appear either blue or yellow. These are weird mixtures, and you wouldn’t think of using them unless you forced yourself with the gamut masking system. 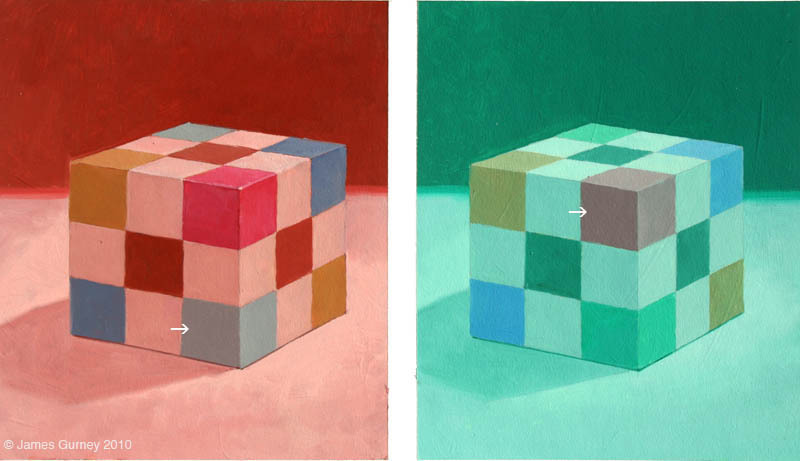 This is reminiscent of the colored cube illusion we’ve seen before, where the red and cyan squares look different, but they’re both really the same gray. This little demo will be part of an article that I wrote, which will be appearing in the upcoming fall print issue of American Artist’s Plein Air Painting magazine. You can order the book "Color and Light" by mail from my online store. extremely helpful, thank you very much!! Oh man, this helped clear up a lot of confusion on it. I read through the blogposts and book chapter several times and I still felt like I wasn't quite getting all of it. Thanks Jim for the video. And I can safely say that if you were to ever put out a dvd of a painting video much like Donato's, I would buy it in a heartbeat. Okay, so it’s basically the same as pre-mixing the color strings like you did for the 30 minute portrait studies, except these colors are based off a pre-chosen gamut, as opposed to being selected from local colors in nature. The challenge is to mentally make that translation from local color to the new gamut. Think I’m ready to give this a shot. Thanks for the post! Thank you, James! The color gamut is by far my favorite topic from "Color and Light". 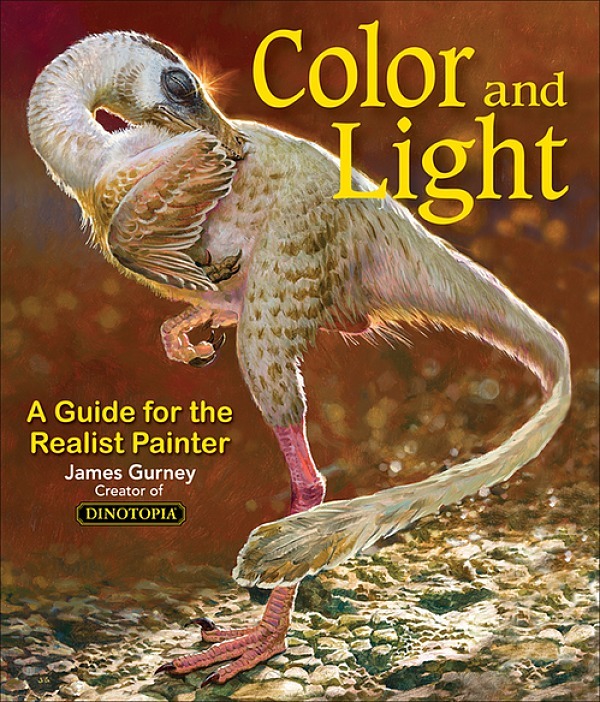 Your approach seems so much more simpler compared to other books on mixing palette colors. Seeing the process in motion is very enlightening. Well done. Thanks so much for this! Great Video. Love the dollies. The YURMBY wheel is so helpful because it shows you that the most neutral gray will work as a yellow (in the cool version) because it is the least blue and the least red. Being able to see a color's relative position in the color space is a tremendous tool for understanding relationships. The tough part for me is evaluating the darkest value tube colors and placing them on the wheel properly. Turning it around, how do you guard against having too intense (out of gamut) colors in the deepest values? awesome, great to see it in action makes it more clear, thank you! I swear I had read your entire blog archive but those older posts must have gone over my head the first time. So do you determine what value range you want to work in before you mask your wheel, so you start with a wheel biased bright or dark? So you choose colors based on relationship? A red violet in your cool gamut, comes out as red gray in your warm gamut? A little mind bending going inwards instead of down. Thanks for showing this with a video. I've read about gamut masking on your blog before and in your book but I never really understood it. The video makes it completely clear. I am a chemist and for us brown and gray do not exist as colors; yet I am always amazed at how portraitists are able to start on one side of the head say in shadow or blue, or the other side in sunlight and end up at the same "color" in the half tones. Not one artist in the years I have studied portraiture could explain it... "Color and Light" and this video finally do! Thanks.. This is a great, no-nonsense method. I'm currently working on applying it to pastels (where there are no tube colors as we know). The challenge here is how to keep within a gamut by choosing the right premixed colors. Has anyone tried that already? Any lessons or tips to be shared? Thanks! Thank you for this insightful post. It's always surprising to see how imposed limitations can change an artist's result for the better. There are far too few blogs that venture into these technicalities, and i'm glad yours does it so well. Enlightening! You were right, James, nothing replaces a video (or real life) demonstration. Another very interesting video, James! Sound mixing was a bit off early on, everything was shifted to the left channel, for some reason; but it ended soon enough that it didn't detract from the content of the video. My teacher actually tried to each us this method when I was taking art classes in elementary school. I don't think any of the whippersnappers in the crowd -- me included -- actually understood what she was talking about. The two examples in this video make it much clearer! Thanks, everybody. This is one of those topics that’s easier to show in a video than to explain in a book, so I’m glad it makes more sense now. Drew: Thanks. I usually stick to three or two. It’s easier to conceptualize the gamut as a triangle. Two is good as well, but then the gamut not so much a two dimensional shape as a line or bar across the color wheel, basically a continuum between to contrasting colors. Steve: you said it exactly. Premixing gives you the colors in all the values you need, and that color range becomes your subjective universe for that painting. Zoe: Nothing wrong with black, but I generally use other colors to gray or darken colors. With yellow, black can shift the hue to green, so you need to use other colors to “steer the tone in the right direction anyway. Daroo: the dolly shots were done with the camera strapped to a bicycle. I just try to eyeball the chroma on dark mixtures, and as you could see in the video, my color mixing is fast and improvisational, not as methodical as some people. It’s OK to have some slop in the mixtures, too, and sometimes I reach a little outside the gamut if I need to. Alonzo, it is mindbending, and one color in one gamut can be something entirely different in another. I often find it helpful to just assign each corner in my mind as “red” “yellow” and “blue.” You raise another important point. The premixing doesn’t have to be the full value range. If you’re doing a high key painting, you would be working within a value gamut, too, and your premixtures could anticipate that. Thank you, Arturo. Brown is a funny color, because we don’t have a name for yellow in its dark value ranges. “Brown” comes the closest, even though we think of it as a more neutral color. Petr: Yes, this system doesn’t work quite the same for pastels or transparent watercolors. There I suppose you’d have to limit the gamut with the “tube” colors or the pastels themselves. But in watercolor you could mix up little bottles or dishes of your ingredient colors, adjusting them to fit the gamut. Orlando, Yeah, sorry about the sound. I plugged my mike into the wrong slot for the second half of the VO, so it defaulted over to the camera’s mike, which was not so good. Gamut masking definitely offers some interesting ideas on creating color harmony. It seems like the creation of a gamut mask is somewhat arbitrary, but I wonder if there is any way to interpret an actual photo and determine its color gamut range. Do any of the photo imaging programs (such as photoshop) have the capability of analyzing a photo (or any image) and creating a gamut mask of the colors used? I would think such a gamut masking tool would be very helpful in analyzing photos and creating a less arbitrary color palette for the artist. Don, if you try couleur.org, by P. Colantoni, there's a digital interface (Windows only, I think) that lets you upload a jpeg and play with various ways of visualizing the gamut, including in three dimensions. I've done a few posts about it, and on my YouTube channel, there's a video of some of the 3D gamut animations revolving in space. It's definitely mindbending. Extraordinary clear explanation! It helped me understanding things that I would do (but very awkwardly) without truly understanding. I think this video will help me through my next experimentations in colour. Great to read/watch this post. Cheers for posting such an inspiring blog! This is gonna help a lot for my underwater scene I was struggling a lot. Thank you very much. This theory will same me a lot of $$$ in the future. I used to eyeball my colors, which can sometimes results to a lot of 'useless' paint. Danke a bunch! Awesome video James.. thanks for posting this and it is great to see some of your technique in action!! So great to see your working method and to have these concepts explained so well...Do I see a DVD release in the future? Recently I've been studying limited color palettes and have really enjoyed this ides of the Gamut masking method here and in your excellent book, Color and Light, but I have a question. I see how you pick three colors to be your "primaries" and then make a triangle mask, but I noticed that within that gamut triangle there are sometimes colors that could not be mixed with the three chosen colors that formed the triangle mask. For instance, in your video you chose the dull red and dull green and blue, but within the mask I saw a magenta that could not have been made with the colors you chose. Can you use any color that appears within the mask even if it isn't one that could be mixed with the chosen colors that made the mask, or is it better to stick to the chosen "primaries"? Diane, you're quite right, and that's a very insightful question. Theoretically you can choose any two color notes from the infinite variety on the color wheel. The intermediate mixtures from those two color notes should in theory be located on a straight line between those "primary" color notes. In practice, though, that line is often not straight, because of the behavior of paint pigments. So I'd say, yes, you can do whatever you need to do to mix the colors that you actually find within the triangular gamut. Even with an outside assist, the resulting gamut should give your painting the harmony you want. Sir, do you also use gamut when painting from life? Or is it only applicable to paintings that are done from imagination? Not usually when I paint from life. I sometimes work with a pigment-limited palette at a model session. The time I use gamut masking the most is when I need to control the gamut for color scripting a long illustrated book or film. After you do it a bit, you can do it mostly in your head, mixing the strings without necessarily actually arranging the gamut masks over the color wheel. What is the BLAST acronym you have attached to the upper left of your palette? I couldn't make out some of the parts on it, but I'm pretty intrigued from what I could. 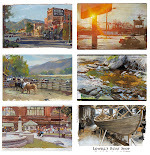 They look like solid things to keep in mind while painting, and an excellent insight into your process! I'm giving myself an intense tutorial on Gamut Masking and Mapping using your methods. Today I took a black and white photograph and traced two separate drawings of it. Then I mapped a warm gamut and mixed my colors. I wanted so badly to introduce a tube color after mixing, but I trusted your advice and curbed that desire. I'm so glad I did! There's nothing like doing something for oneself to see the value in it! Tomorrow I make the same painting using a cool gamut. Thank you a million times! I forgot to add that I am following BLAST to the letter! Janet, that sounds like a great exercise. I'm so glad it's working for you. Good color really does take discipline, like walking through a candy shop and just buying one peanut cluster. This actually a part I got a bit stuck while reading the book, but the video and the way to go about gamut mixing solved all my questions. Really enjoying Color and Light and can't wait to apply everything I've learned so far, both traditionally and digitally. Thank you for the wonderful books you've released, the great content of this blog and for all the wonderful insight you share with us James! Mr. Gurney, conceptually, if you are planning an illustration and want to evoke, through the color gamut of the work, a certain emotion or feeling (if possible) is this something gamut masking can help with? Or is this beyond the scope? Mark, yes, in a general sort of way. Think warm, glowing colors and lighting to suggest warmer feelings, and cold or gray schemes to evoke moods of depression, dread, or isolation. Big gamuts to suggest happy, bright moods. These mappings are fairly general, and depend on a lot of other compositional factors. So, say that i am using only Cyan, Magenta, Skin, Yellow, black and white as my color base. From there on, i went ahead to create a color gamut with dark tones to lightest tone, maybe some extent of harsh rim light alternatives and richer, more saturated shadow hue. Question is um, i am using poster paint sakura, as watercolor of sorts, with light washes and some dry brushing. I often encountered problem when my paint runs out so, when i try to recreate the same color, it probably miss slightly of the right hue, often times alot. So, using this gamut thing will definitely help me alot but i'm very much confused on how to control it, and deviate a little while creating the effects i need?Help? Alexander, when painting with physical paint, you don't need to use cyan, magenta, and yellow. You rarely need those full strength colors, especially not all in one painting. You can begin restricting the gamut by using, say, yellow ochre for your yellow or burnt sienna for your red. 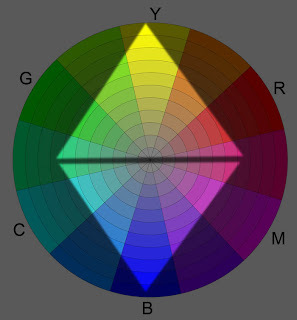 But once you have chosen your gamut, you mix a variety of values of each of your principle colors. You can also mix batches of colors you will be using a lot so you don't run out. Doing this premixing saves time later when you're painting. James, your work on gamut mapping is fantastic. Thank you! The sections in your Color and Light book were awesome but it felt like the tip of an iceberg. I bet a whole book could be written on palette design using gamut mapping with an in-depth analysis of how different shapes and positions on the wheel affect the perception and mood of the image. If you've written more on the subject elsewhere, please direct me to it. Otherwise, please post more articles about this on your blog! James, just a quick heads-up that Krita's newest preview version now includes your gamut masking as a new feature!